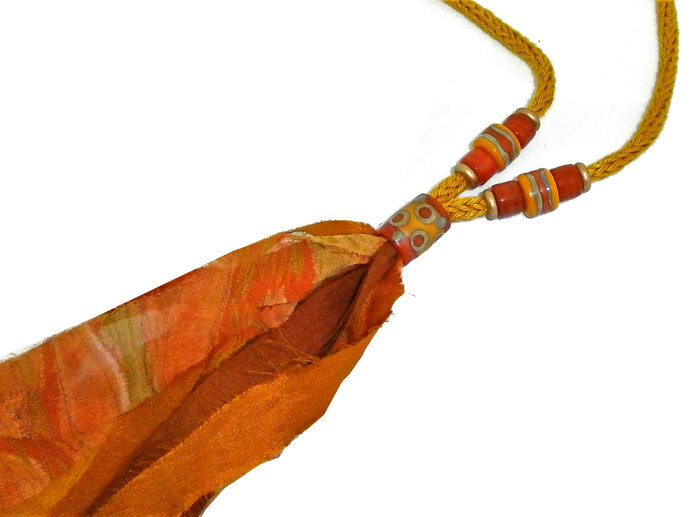 This DIY Tassel Kit contains all you need to create a Luxurious Sari Silk and Lampwork Bead Tassel Necklace. 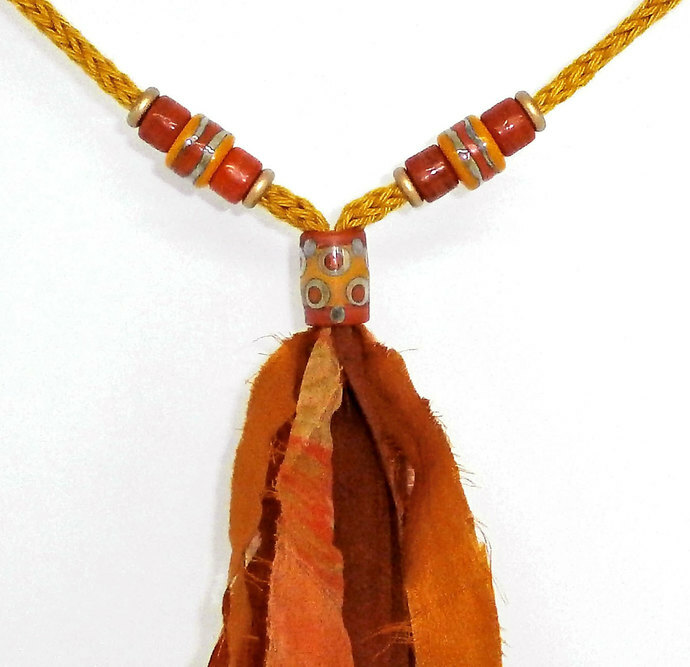 I love Sari Silks and Tassels so decided to make some Lampwork Bead Caps and voila a DIY Kit. You can see a Tassel I made as an example in photos 6 and 7. For the beads (which are very organic in shape), I have used my favorite Effetre colors Saffron Yellow and Orange with Reactive Double Helix for some Brassy Shine and I have slightly overcooked the glass to get a slightly grungy feel to the set. 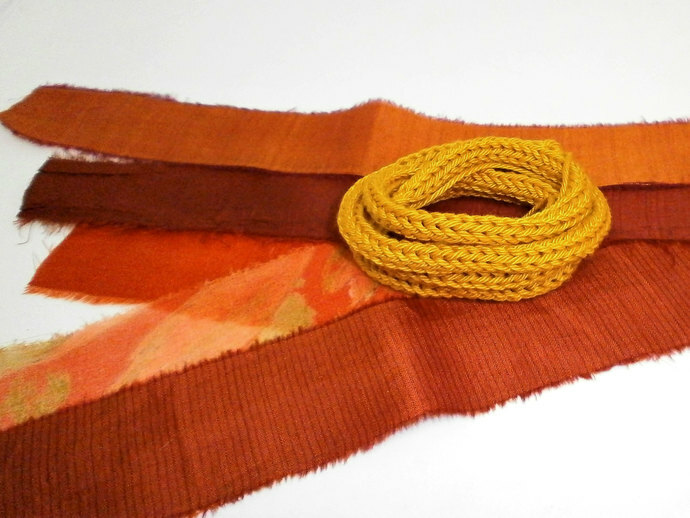 I found some wonderful Recycled Sari Silk Ribbon in shades of Red and Orange which I have sorted, ironed and removed excess threads - There are 5 pieces all 30cm (almost 12 inches) long and they range from between 30mm and 45mm wide. 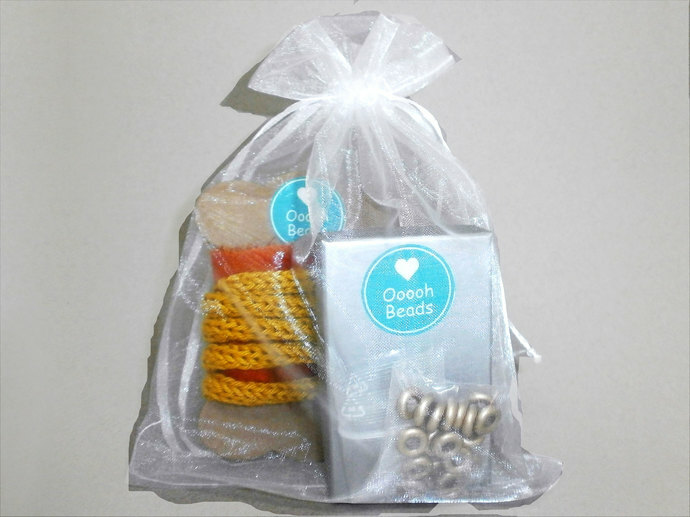 And it all comes packed into a Organza Bag which makes it perfect for Gift Giving. 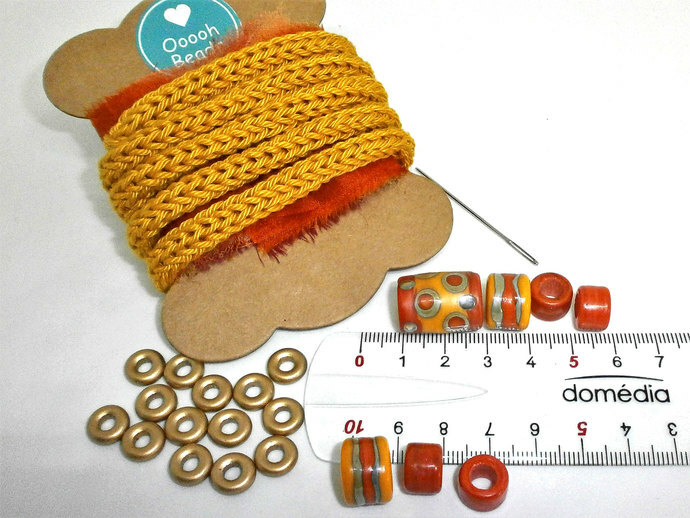 Lampwork Bead size: Focal Tassel Cap 20mm from hole to hole, 13mm in Diameter and it has a large 8mm hole the 2 Decorated Barrel beads measure 9mm and 10mm from hole to hole and 13mm in diameter and the 4 Coral Spacers are range from 5mm 7mm from hole to hole and 10mm in diameter. The Czech Glass spacers measure 2mm from Hole to Hole 9mm in Diameter and have a 3.5mm hole. 80cm of my Hand Knitted 100% Cotton Cord in Gold. 1 Darning Needle for finishing the cord. 1) Photos are taken using natural light and a flash, I color match the photos to my screen, but all computers display colors differently. 2) The photos of the tassel 6 and 7 is to show how the Tassel could look when completed. 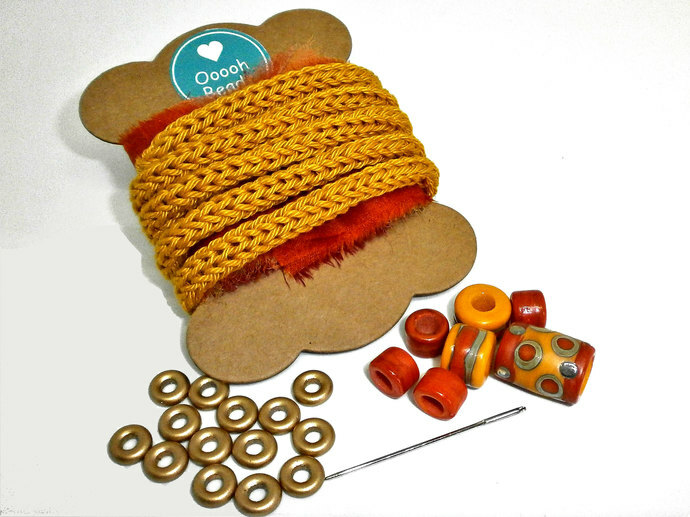 3) This Kit does not include the Sterling Silver Hook discussed in the Tutorial. I used Effetre and Double Helix in this set and all my beads go directly from the flame into my digital kiln. I do combine shipping, so you only pay shipping on the first item and the others travel for free. 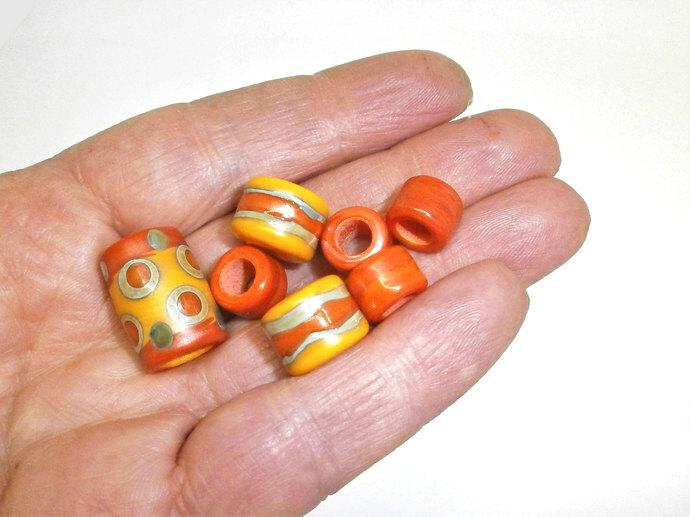 Handmade Lampwork Beads and Beading Supplies. I live in Deepest Darkest Rural France, with a couple of horses, a dog and 4 cats. So welcome to my world, I hope you enjoy my offerings and if they inspire just a twinge of "Ooooh Beads" in you, then it is worthwhile :) and if you have any questions please do contact me.